Doctor's Choice Compression Elbow Sleeve *** DISCONTINUED *** | Doctor's Choice Compression Elbow Sleeve. Provides support to weak or injured elbow. Doctor's Choice Compression Elbow Sleeve. Provides support to weak or injured elbow. 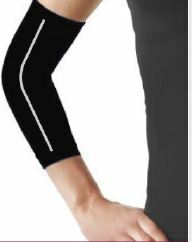 Doctors's Choice Compression Elbow Sleeve Provides support to th weak and injured elbow. It also improves circulation thus increasing the blood flow.